I got invited to a poker game last night with a 5pm start time in a seven handed game where all the seats were spoken for. The game was a two game mix, $1500-$3000 2-7 triple draw limit, and Pot Limit Omaha with blinds of $500-$500, with $1500 dead in the middle with a cap of $35,000. For those that don't understand what that means, I'll explain how the PLO works. The big blind puts in $1500, and the small blind puts in $1000. The dealer takes $1000 from the big blind, and $500 from the small blind and just throws it in the middle of the pot. It's just extra dead money and it also helps to make sure that the cost to play a round in each of the two games costs the same amount- $2500. The $1500 does NOT count as part of the pot, so if you wanted to raise before the flop and were the first player in, the maximum you could make it is $2000. After the flop, the $1500 still doesn't count as part of the pot. The $35,000 cap means that once the total betting for an individual player reaches $35,000, there is no more betting. 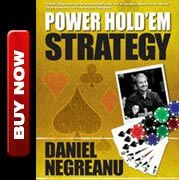 The most you can lose on any given PLO hand is $35,000 which accounts for 70 big blinds. In a previous blog I wrote about a guy who bluffed me with KKK3 in a PLO hand. Well, my first capped pot of the night was against that same guy. This is rare, but we had ALL 7 players to the flop for $2500 a pop! I was on the button with Ac 4c 8 8 and the flop came Qd 7c 3c. Everyone checked to me, so I fired out $10,000 with every intention of calling a check-raise. Well, I got checked raised for the cap by this hand: Kc Tc 7s 4s. As is customary in these games, we both agreed to run the turn and river twice. On the first run it came 2s Th. He rivered me with two pair. On the second run it came Ts Kd, again beating me with two pair! A club never hit, so despite being a 2-1 favorite on both runs, he scooped me. It was raised under the gun by a loose, aggressive player and then in second position the solid top professional player called. The small blind called the $2000 raise as well, and I defended my big blind with Ah 4h T T.
The flop came 8h 3h 3c and I decided to bet out $4000 into $9500. I'm the most likely player in the hand to actually have a 3, so this is usually a good spot to lead out especially because I actually do have an overpair as well as the nut flush draw. The pro called. The turn was the 2h. With the board already paired, I didn't see much point in betting here, but at the same time, I realized it was very unlikely that my opponent had a full house. It was hard to imagine him calling a raise in second position with either a 3-8 or 3-2 combo, so if he did have a full house, it would have to be 8-8. So I checked and he bet just $6000. I called, a little more worried now because there aren't a lot of hands he could be bluffing with. If he did have 8-8 I could still catch a Ten or the 5 of hearts for a straight flush. The river was a King. I checked, he now bet $19,000 and I had a tough decision to make. Ultimately, because I really like to sleep at night, I chose to call after telling him he must have 8-8. Sure enough, he turned over 8-8-J-Q. This wasn't a very good call on my part despite having the nut flush. The only way I could ever win the pot is if my opponent was pulling an elaborate bluff. Calling on the flop weak, betting small on the turn turning a hand into a bluff, then bombing the river. I would essentially need him to have a hand like 3-4-5-6 and for him to decide that he needed to bluff me off of a flush or a better kicker. This is a spot where I should have taken a few extra seconds to think it through because it just seemed so obvious right after I called! A little later on I witnessed something quite strange. Something I have never seen before in 20 years of playing in Las Vegas casinos. We play this game seven handed, but there was an eighth player who wanted to join us. 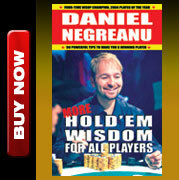 All of the players in the game agreed to make it eight handed so he could play. That's been standard practice for as long as I can remember. If everyone agrees, then the players have the right to make the game eight handed. We were told by the floor person that this player we wanted to add, wasn't on the list of players that are approved to be the eighth player in the game. What the ????? I was shocked, and so curious to find out how one gets on this list? I was then told that it's decided by the poker room manager. I shared my thoughts on this practice in just one word, "Shady." We don't know how it is you get on a list like that. Is it based on how much you tip the poker room manager? What other factors could there be? We were playing in a private room in the poker room and were then told that in this room you could only play the game we were playing 7 handed. Then we were told that if we went out into the main poker room we could make the game eight handed. So in other words, you have more options and flexibility in the main room than the private room. It all just seemed baffling to me. The idea that there is a list of approved players that can make a game eight handed that supersedes the requests of the players in the game who are actually paying rake, is ludicrous. My plan was to either put in a six or eight hour session depending how I felt. After six hours I was doing quite well so I decided to go the full eight hours and quit at 1am. Then at midnight, my eyes started to get heavy and I was just exhausted so I made the decision to quit after seven hours of play. Twenty years ago when I was living an unbalanced, unhealthy lifestyle, playing a 24 hour session was a piece of cake. I did it all the time. I would wake up, shower, play poker until I couldn't any longer, sleep, then rinse, repeat. That's just not my life anymore. I spend so much more time doing other things now. Whether its the gym, playing soccer, being a politico junkie, volunteer life coaching, etc. By the time midnight rolls around I'm spent, whereas in the past I'd just be getting started. I'm totally OK with this. I always wanted my dream life to be a balanced life and I have achieved that. Having said that, I really have missed playing mixed games in the evening here in Vegas and I'm glad I set a goal of playing 200 hours in 2016 and I expect to exceed that number. By the end of the night, the final tally was a $105,700 win which recoups a previous $107,500 loss in my last session close to a month ago playing $2000-$4000.